Your whole financial picture, all in one place. As the advisors, this tool allows us to get a thorough understanding of what is working well and what needs attention for all of our clients. It allows us to stress test, optimize, and strategize with our clients so that they are best prepared for the next steps in their careers and finances. The tool can be used to do something as simple as do a better job tracking spending and budgeting, and as advanced as understanding what your retirement years could look like. 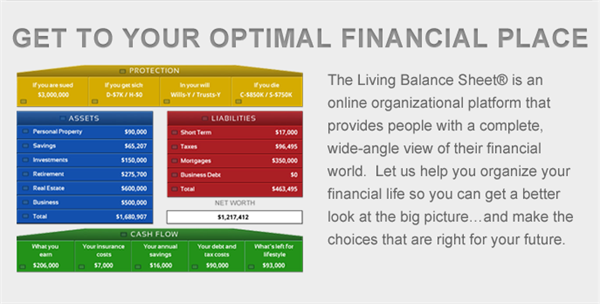 The Living Balance Sheet is a unique tool that allows our clients to see all parts of their finances in one place. People are challenged with understanding each piece of their financial world, let alone how the different parts work the right way together. The Living Balance Sheet allows people to understand that all decisions they make, for better or worse, have ripple effects.